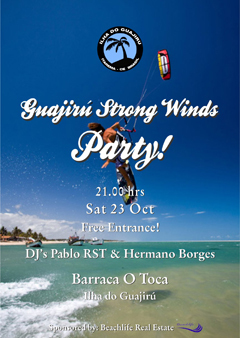 October 2010 - The Guajirú Strong Winds Party 2010 the 23th of October! To download or print your personal invitation, please click simply here! You haven't yet a reservation or room at the island? Visit the stay section of this website or simply start to travel and go: if you find no room, the island's numerous beanbags at the beach will sleep you under the starry sky for FREE!